Finally after a long wait EPM 11.1.2.3.500 has arrived and the patch comes in a bundled 1.8GB download or as Oracle likes to call it a superpatch. There are a few exceptions as the .500 Essbase related products were released last week and are separate downloads, I believe this also applies to DRM. It is amusing that the patch is under what is now known as Hyperion HUB in Oracle Support, if anybody can remember HUB it was the original name many moons ago before changing to Shared Services, everything seems to go in a full circle. Note: Support for Firefox 17 ESR is deprecated with this release. I know some will look at that list and ask where IE11 support is or windows 2012 server, well they are not there and considering how long it has taken for .500 to be released and how far 11.1.2.4 looks off you may be in for a long wait. Also if you are using planning in non ADF mode then IE10 is not supported. Besides some new additional functionality to various products I think the main talking point will be the EPM mobile app. A very interesting update for planning besides the new mobile functionality is the performance enhancement claims which seem to be suggesting a massive improvement in response times and memory and CPU usage. Response times were reduced by up to 98% comparing to earlier PS3 releases. The improvements are greater with larger loads and with actions involving large forms, but even single user response times for actions such as scrolling through forms were 10-20% faster. Memory and CPU usage were reduced resulting in more than a 50% increase in Planning server capacity. These results are based on testing of an actual customer application with Hyperion Planning running on a Windows 2008 server with 12 physical cores. The server had 144 GB RAM but the Planning heap size was limited to 4 GB. Actual performance may vary based on application design and hardware specifications. Unfortunately I don’t see the same sort of improvements mentioned for Financial Management. Another noticeable configuration option is for Calculation manager which allows change from ADF to Bindows if performance issues are being experienced, is this Oracle agreeing there are performance related issues around ADF. The readme for the patch is huge so it will take a while to digest as there are not only a large number fixes but at the same time a raft of known issues. The patch in the main looks to be applied with just Opatch but depending on the product set being applied to there are quite a few additional steps to follow so make sure to read through thoroughly. One thing is nice is that applying the patch looks to automatically install the required ADF patches in to oracle_common home. 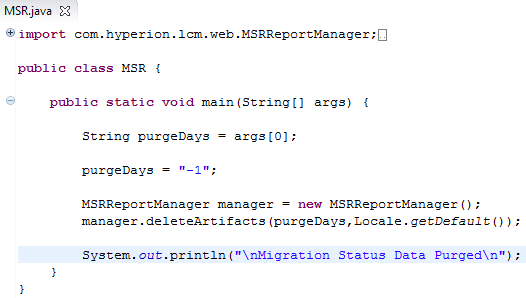 Prior to 11.1.2.3 it was possible to purge migration status reports from within Shared Services. In 11.1.2.3 for some reason the option has disappeared even though the documentation states it should be possible. I am not sure if it was mistakenly removed with the change of Shared Services being embedded into workspace and if so then maybe it will return, delving into the underlying code the java server page that used to be called purgeMSR.jsp still exists and so do the Java classes surrounding it. So what are the options to purge the data, well in 11.1.2.3 a new Shared Services registry setting was introduced which defines after how many days the data will automatically be purged, maybe this is the reason why the option was removed form Shared Services? It would nice to have both options if that was the case. If a registry report is run then under Shared Services Product you will see the new property MSR.PURGE.EARLIER.TO.DAYS which has a default value of 30. 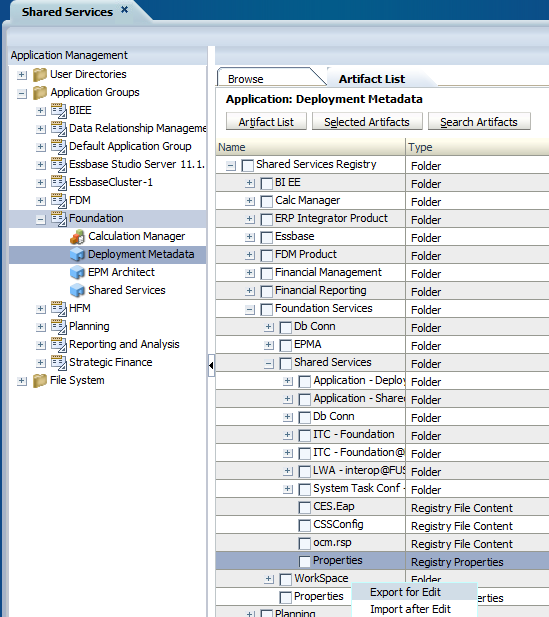 Analysing the Shared Services logs highlights the purge property being read from the registry and then being executed. Please note the checking and purging of the migration status data is automatically run every 24 hours. Changing the number of days to purge value can be achieved by a through a few different ways. The properties file can then be edited and updated with the new required property value. Once updated use the “Import after Edit” option to load the new value back into the Shared Services registry. The value can also be viewed and updated using the epmsys_registry command line tool. If you are happy with just using this method then that’s good but I wanted to look further into what was being run behind the scenes. After spending time researching I managed to track down the code that the purge runs though I think it is first worth pointing out how the LCM migration data is stored. In the Shared Services relational database/schema there are three tables which store all the migration information. If you are interested in understanding the details of each of the fields in the tables then I recommend checking the Relational Data Models document. When a purge is run the following SQL statements are run against the LCM migration tables. In each of the statements the question mark holds the time to purge from and any data older than the value passed in will be removed. The “F”,”S” and “W” status values stand for “Failed”, “Successful” and “Warning”. Even though the Migration Status Report displays the full date and time this is not the way it is stored in the relational tables. The date in the tables is stored in Unix time which basically means the number of seconds that have elapsed since 00:00:00 January 1st 1970 not including leap seconds. So if you are planning to run the SQL then you will also need to calculate the time which can be done by many different ways including SQL or there is even a website which will convert a date for you. One of the SQL statements also selects the log files and package name files. This is because each time a LCM migration is run a package xml file is generated which is basically the same as the migration definition file and if the migration is run by the command line utility a log file is created. When a purge is run these files are also automatically deleted so if you are going to be running the above SQL then it is worth considering building into the process the removal of these files. So there we go a couple of options to purge LCM migration data but I didn’t want to stop there and looked at tapping into the Java classes that are available. The classes that are used by the purge routines can be found in lcmWeb.jar which can be extracted from the Shared Services web application. The jar can be extracted from the interop.ear file or the foundation managed server temporary directory. I created a very simple Java class which the value for the number of days to purge from can be passed in and the data is then automatically purged. The class was then compiled. I created a batch script to include the classpath to the necessary jar files and the EPM oracle instance variable which is required otherwise the Java code will not run successfully. And that is all there is to it so now the LCM migration data can easily be purged from command line by calling the script passing in the purge value.